The Saint Bernard is known as the "gentle giant," and is an enormous, big-boned, powerful yet friendly dog breed. The Saint Bernard is known to have a strong sense of smell and an intuitive sense with respect to potential avalanches. They were originally bred as rescue dogs working in the Swiss Alps. Saint Bernards are your best friend in an avalanche! 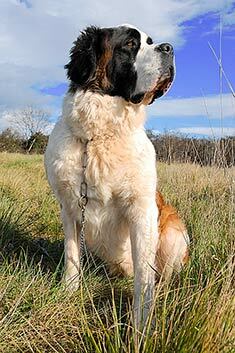 The Saint Bernard originated in Switzerland. Saint Bernards range from 24 inches to 28 inches. Saint Bernards range from 110 to 200 pounds. Saint Bernards typically are brown and white, red and white or brindle and white. Saint Bernards can have longhaired or shorthaired coats. The former requires more grooming than the latter. The Saint Bernard is a very gentle and friendly dog breed who loves children. This dog breed can make a good family pet, but it has to be obedience trained early because of its large size. The Saint Bernard should get daily exercise and have plenty of room to move. The Saint Bernard is considered to be a steady dog breed. 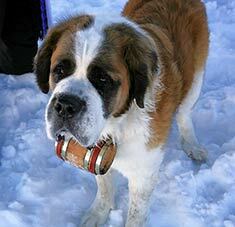 The Saint Bernard is susceptible to heart problems, entropion, skin problems and hip dysplasia. The expected life span of the Saint Bernard is 8-10 years. Saint Bernards do best in a house with a fenced yard, since they tend to be inactive indoors. The Saint Bernard also loves to be around its family. The Saint Bernard is in the Working group. Find Saint Bernard Puppies with our Free Breeder search!